Whenever I think of my great grandmother Sturgis, I think of pickles. Now, she died when I was just a young child, so I’m certain my memory of her is wildly inaccurate, so I offer my sincere apologies to anyone who knew her. What I remember about her is hundreds and hundreds of jars of pickles—way more than an elderly married couple ever needed or could possibly consume. I remember a basement lined with shelves laden with dusty jars of all types of pickle–chunks, bread and butter slices, whole sweet pickles, dill spears… I imagine her an avid gardener who just couldn’t bring herself to rip out those cucumber plants once she’d put up enough pickles for the year. I know the temptation. The cucumbers are there. Pickles are good. You wouldn’t want those cucumbers to go to waste, would you? 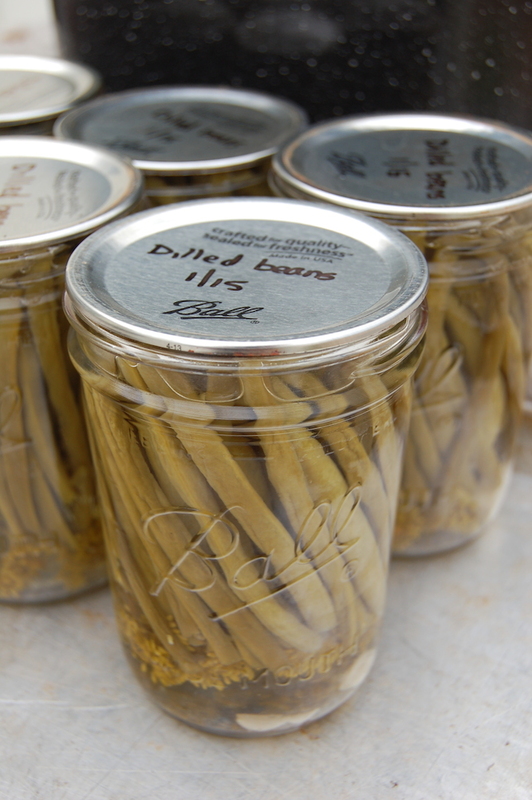 Pretty soon, the pantry shelves are groaning under the weight of pickle jars, you’re buying vinegar by the case, and you’re sending every guest home with a selection of half a dozen types of pickle. Before you know it, you’re known as “The Pickle Lady”. Neighbourhood children sneak around the house, daring each other to peek through the windows for a glimpse of the reinforced steel shelving stacked with pickles. Guests feign cucumber allergies. Family members drop hints about obsessive compulsive disorders their “friends” have. Your husband threatens to move out unless you remove the stacks of pickle jars from the bedroom. This is why I only plant pickling cucumbers every other year. I can easily make two years’ supply of pickles with one planting (and still have cucumbers left over for the neighbours who like to make their own pickles). And it reduces the risk of becoming The Pickle Lady.